Hi all!! I know awhile back I promise to do a giveaway since I reach 400 followers, then things were just so hectic that I didn't get a chance to do it. However, before I left for my trip I was able to do some minor cleaning of my craft room and found quite a few supplies to be given away. 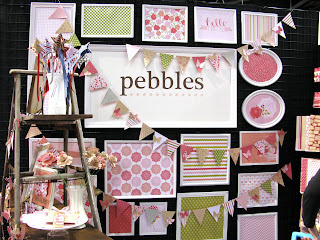 If you love ribbons, there are lots of ribbon on this giveaway. 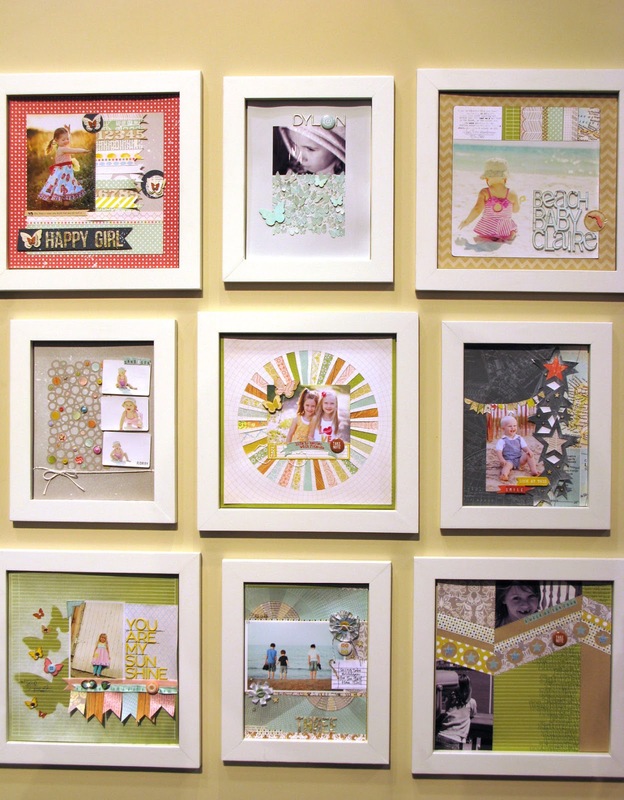 I was rushing when I prepared it, so quite a few items didn't get included in the pictures, like a set of fabric tape from Love My Tapes, more ribbons, and some other random embellishments. Including in this package are some stamps from Sweet Stamp Shop, Denami Designs, Hero Arts, ribbons from May Arts, American Crafts, etc. Some flower sets in brown, blue, pink, etc. I didn't have time to take better picture or more updated picture as more items were added after I took this pic, just know it'll be filled with fun goodies. I'll have this giveaway open till midnight EST, March 5, 2012. Thank you for following my blog and thank you for your sweet comments. I read all of them and I truly appreciate them as your comments encourage me to do better, to be better. Thank you for your support as well. Hugs!! Yep... yep... I am on Moxie Fab World!! 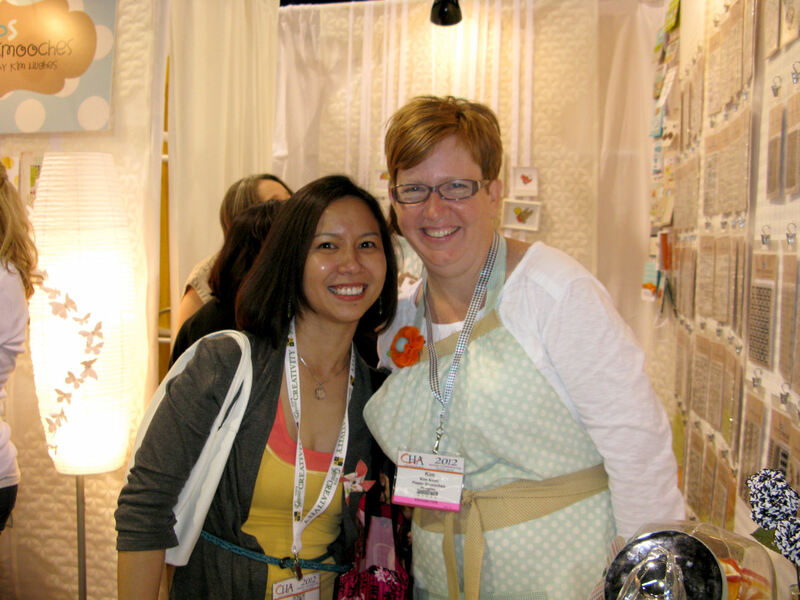 I was so stunned when Cath sent me the invitation to be featured as moxie Fabber of The Week. I had never won any of Moxie Fab challenge (until this past week) and as much as I want to, I wasn't always able to join the challenge. 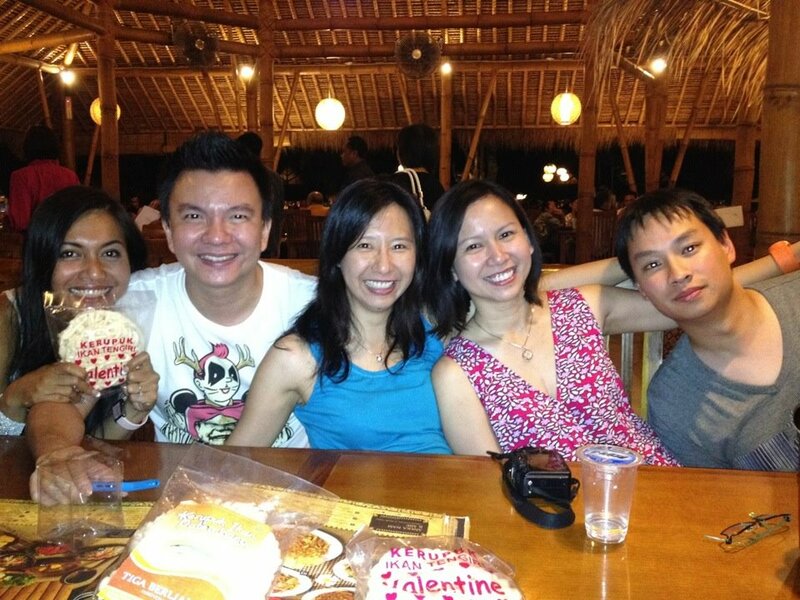 At this moment, I am still enjoying my time with my family in Jakarta. Savoring every moment. But, I want to pop in real quick to share this happy news. 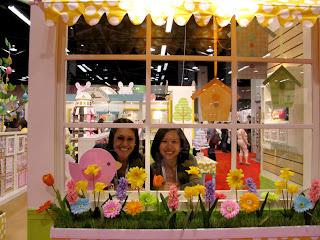 Please check out Moxie Fab World. 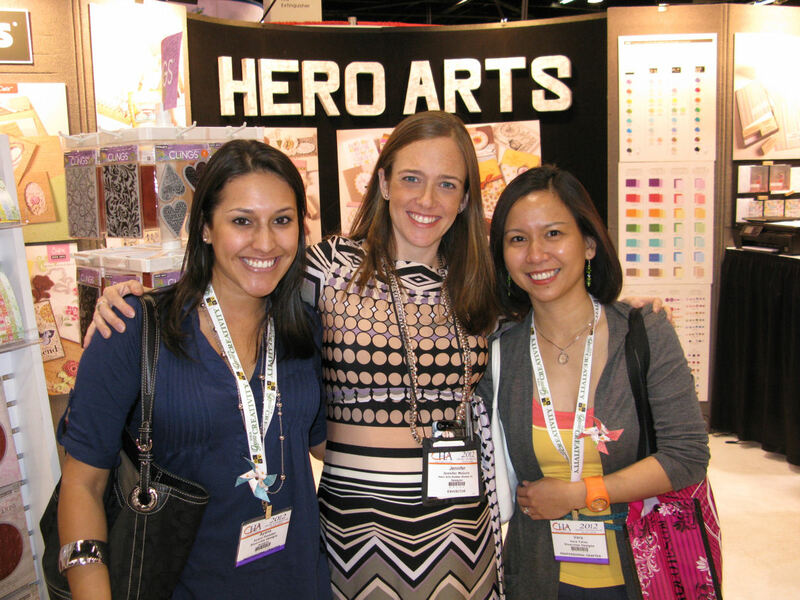 Thank you for letting me sharing this moxie fab news!! Hi everyone! 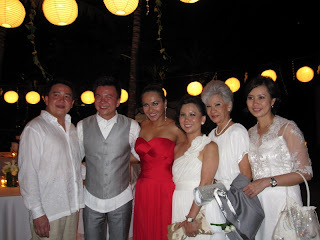 It's time to share some pictures from my brother's wedding to the love of his life, Denada. The wedding was AMAZING! Everything turned out so well and it truly was the most beautiful, lovely, and FUN wedding I've ever attended. The bride looked so gorgeous and my brother looked so handsome. 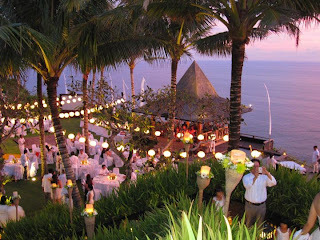 The whole wedding party stay at Khayangan Estate in Uluwatu, Bali a super gorgeous place. There are 6 villas in the property, 3 for the bride side and 3 for the groom side. The wedding festivities start the say before with what we called "Flower shower". The whole purpose is for the whole family giving their blessing and cleansing the bride and groom, so may they start their marriage with clean heart & soul. For me, the whole tradition is very touching. Both, the father from the bride and groom side already passed away, so you can just imagine that every time either name was mentioned we all get teary eyed. The dads were missed, but we all believe in our hearts that both of them were there giving them their blessings. This first pic below is from the flower shower ceremony. 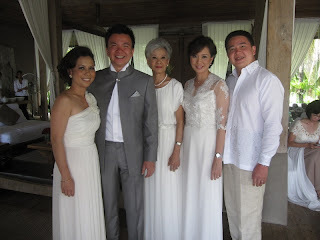 The wrap around the bride's shoulder was made of jasmine flowers. It's so beautiful, delicate, & smells amazing. Denada at the flower shower ceremony. Afterwards, there's more traditional event. 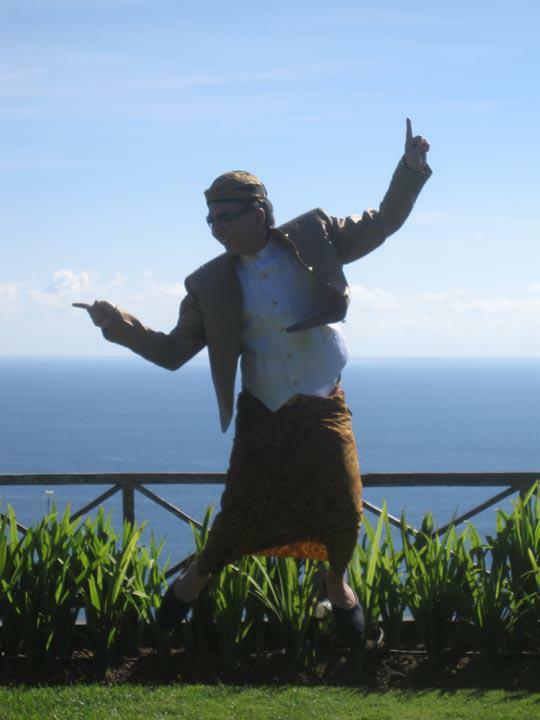 I cannot quite translate the wording, but it was a fun event and my brother get to dress up in this Javanese dress. And, you can see from the pic, what kind of guy my brother is. He's so fun & loving. There's no boring moment with him. This wedding truly a combination of a few traditions. We did several different ceremony to honor Denada's Batak & Javanese heritage, and our own Chinese heritage. Our family is a combination of many different culture and religions, yet we respect each of them. Our love for each other comes first. Then, the festivities continue the next day. THE WEDDING DAY. The moment Jerry saw Denada walked down the step, he immediately get teary eyed and so am I. I kept thinking how happy I am for him and how I wish my dad was there and that for my dad to give his blessings. We are a very close family, so it's hard when one or more is missing. The gorgeous couple. Love their smiles. And here they are, Mr. & Mrs. Jerry Aurum Wirianta. Look at how happy they are. My SIL is so beautiful inside, out. I know my brother truly found the girl that's perfect for him. They compliment each other so well. Both are thoughtful, loving, fun, silly, and very family oriented. I love this couple beyond words. The wedding reception was held later in the evening. Here's our family picture. The bride was getting ready at her villa. Me, the groom, Jerry, my mom, my SIL Regina, and my brother, Jeffrey. Well, I hope you enjoy this little post. Hopefully over the next few days I can post a bit more. To Jerry & Denada, congratulations. Dena, welcome to the family. I love you and you make our family complete. Boy (hmm.. this is Jerr's nickname), I am so happy for you and you know I love you beyond words and would do anything for you. 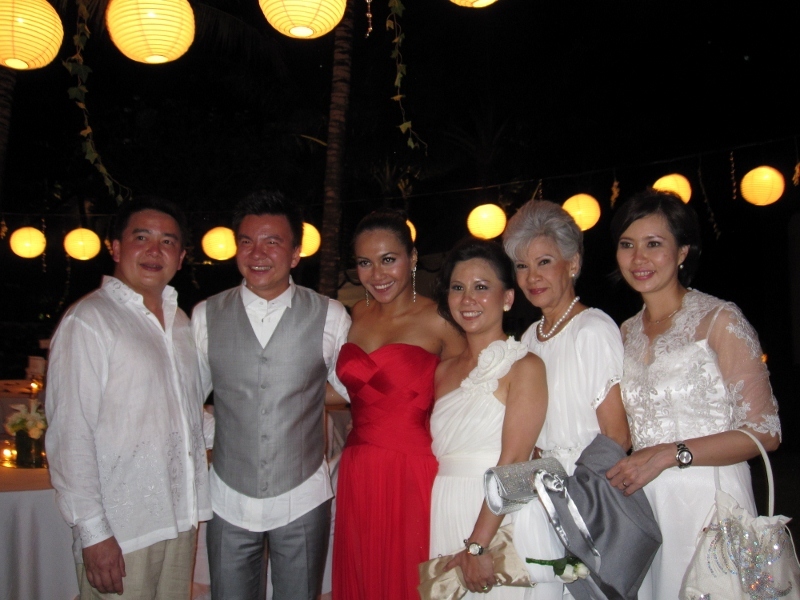 Congrats again and may your marriage always be blessed with joy, love, respect, support, & happiness. Love you. Hi everyone! Quick post for today. Hope this goes up as scheduled as I am still in Indonesia. Today, I am heading to Jakarta from Bali to spend a couple weeks with my mom. I am ready for some down time. With the wedding's done, now I can breathe a bit before heading home to a pile of work. LOL, kind of hard to enjoy a vacation when you know work waiting for you. But, I plan on enjoying my time with my mom. 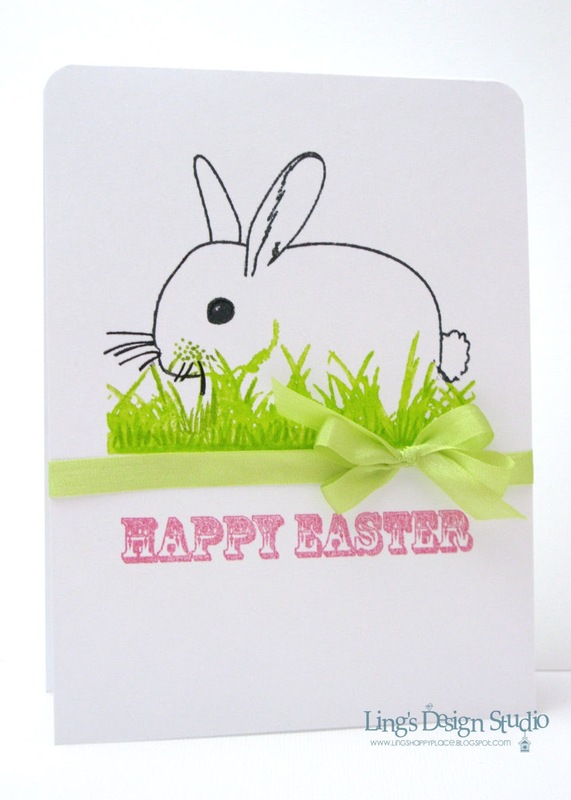 Today's card is using the February release from Sp& Company called Spring Bunny. 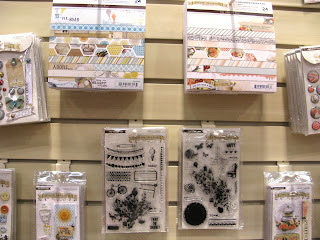 For more inspiration using Sp & Company stamp, please check out their blog HERE. Thank you all so much for stopping by here and have a great Friday. Hi my lovely peeps! I just want to say a quick hi from Bali, Indonesia where I am attending my li'l brother's wedding. All I can say, it's the most beautiful and most memorable, awesome wedding, ever!! Part of the whole wedding that I treasure the most besides getting a new sister, is getting to know my cousins! One I haven't seen over 2 decades and some I met for the first times. Our family so scattered all over the world, so it's beyond awesome to finally meet them! Here's a pic of my new SIL, my brother, my cousin Julia, me & my cousin Teri who lives in Gold Coast, Australia. I will share plenty of pictures soon. Meanwhile, I also want to quickly share this happy news that I won Moxie Fab World Cutting Tool challenge. See the card and the announcement HERE. I am so excited for this as this is my first Moxie Fab winning. Yay!! That's all the update for now. More coming soon!! Hi all. 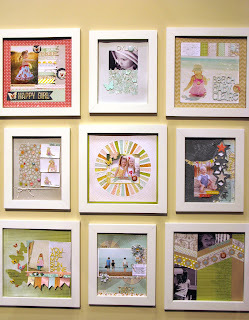 Just a quick note to let you know that I am the guest designer at Lily Pad today! And... if you scroll down after the interview, you might see another announcement there. 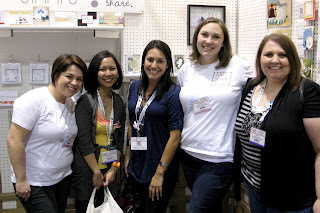 :) I am thrilled to be joining these ladies whose most of them been my supporter when I first started blogging. 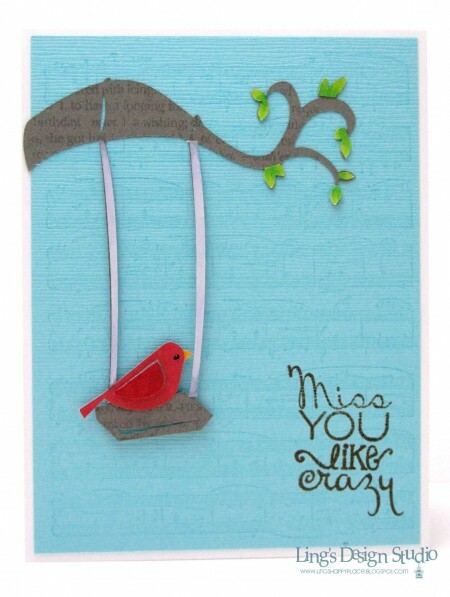 I am sharing 3 cards complete with instruction there and here's a look at one of my card that I share on Lily Pad. 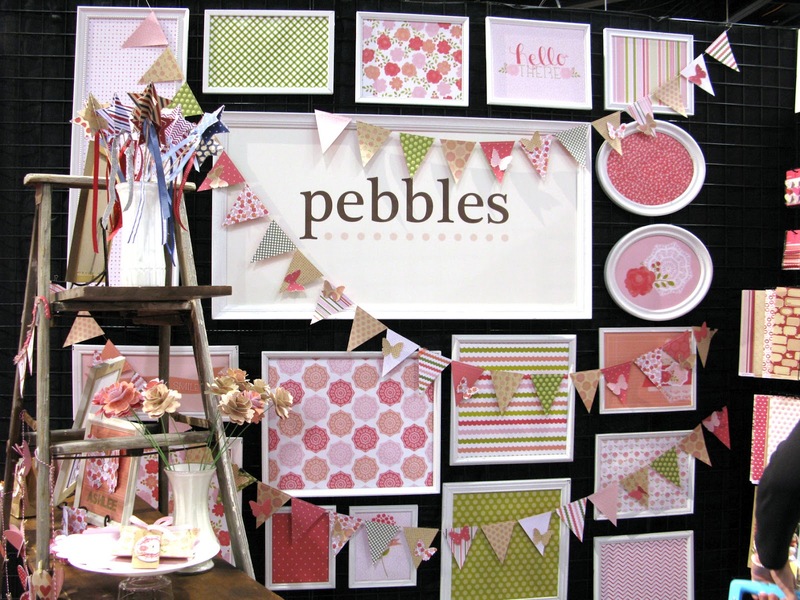 Please check them out at Lily Pad. I am busy packing and getting ready. One more day before my trip!! Can't wait to see my mom and my brothers and their beautiful other halves. Back on Thanksgiving day, my stylish niece Maddy, expertly added a turquoise feather to my hair. Secretly, I always wanted to add wild colors to my hair. I know, I know... as goody, goody as I am, I do have a bit of wildness, you know. LOL, very, very little bit. And, the turquoise feather was a fun way to add color to my hair without actually coloring it turquoise (and she put it so well, that no one at the office ever know I had it). Why do we talk about hair? Because, yesterday I went with blue hair for my fairy and today... I go with hot pink! :) Please welcome Brella Fairy to Some Odd Girl collection. So, what do you think of the fairy collection so far? 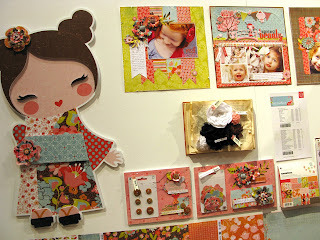 If you need more incentive or more samples, then check out what the DT gals created for Brella Fairy at Some Odd Girl blog. I am back for a second post for today. If you're looking for Some Odd Girl new release, please scroll down. 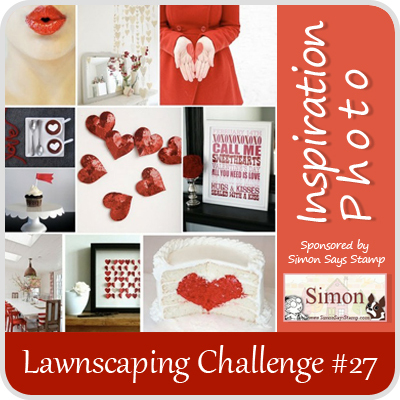 Time for a new Lawnscaping challenge #27. 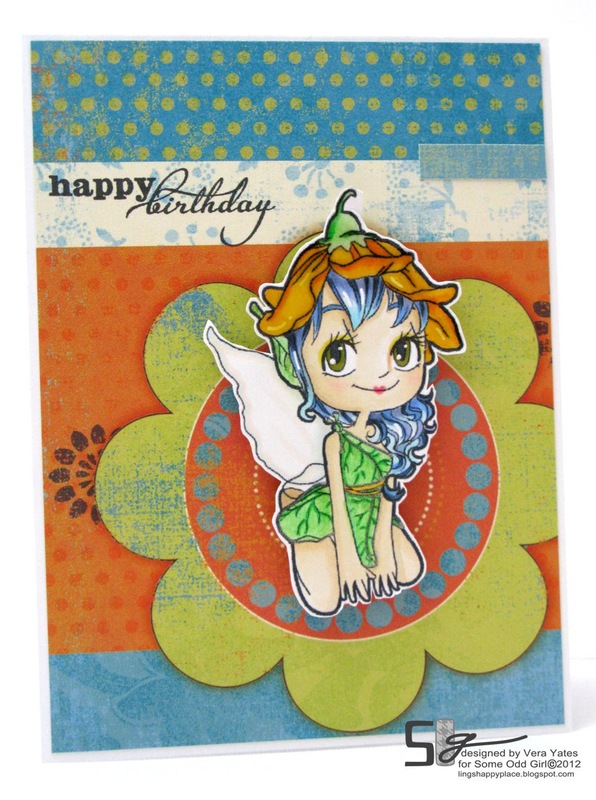 By the way, have you seen all the new Lawn Fawn stamps that coming out? Love, love, love them. Quite a few of them on my wishlist. Anyway, our new challenge is to create a project inspired by the above picture. 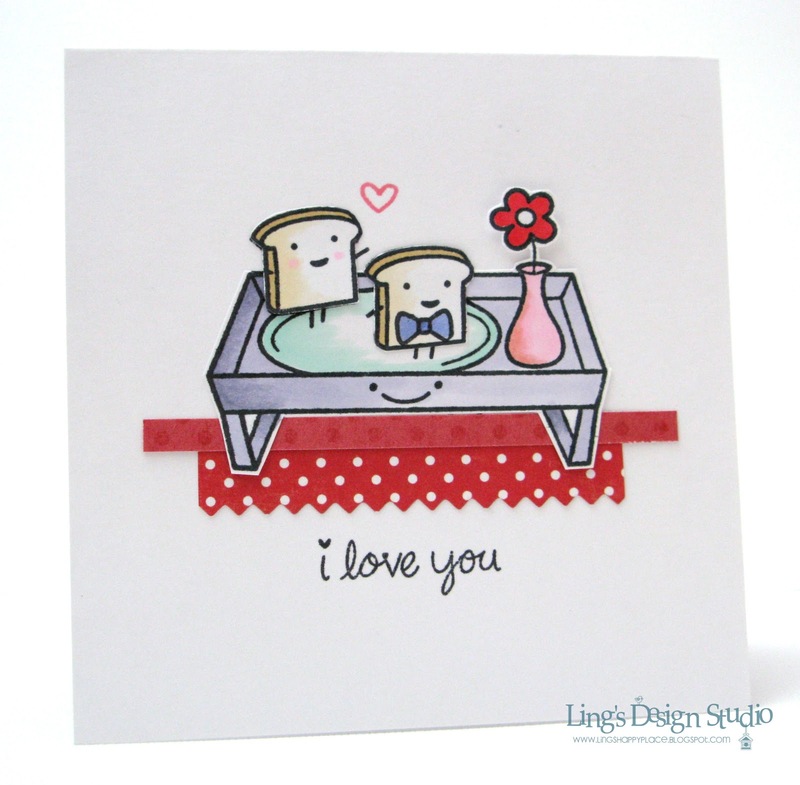 All those red and heart inspired me to create a loved dovey card. I gave this card to hubby already. 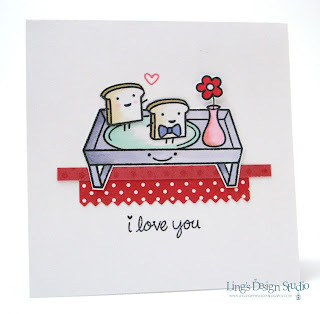 I love toast, so I told hubby I love him like I love toast. LOL. And hubby often makes me awesome breakfast, so this image is just perfect. 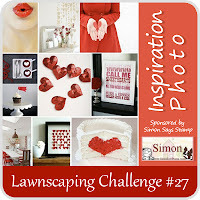 You have 2 weeks to enter the challenge and for more inspiration please check out what the DT gals created at Lawnscaping. I am also entering this card for Moxie Fab cutting & trimming challenge since I did lots of cutting for this card (I fussy cut the the tray & toasts and use paper trimmer for the border strips). Hope you will play along with us. Good morning! Are you ready for some cuteness?? It's time for the latest digital stamp release from Some Odd Girl. 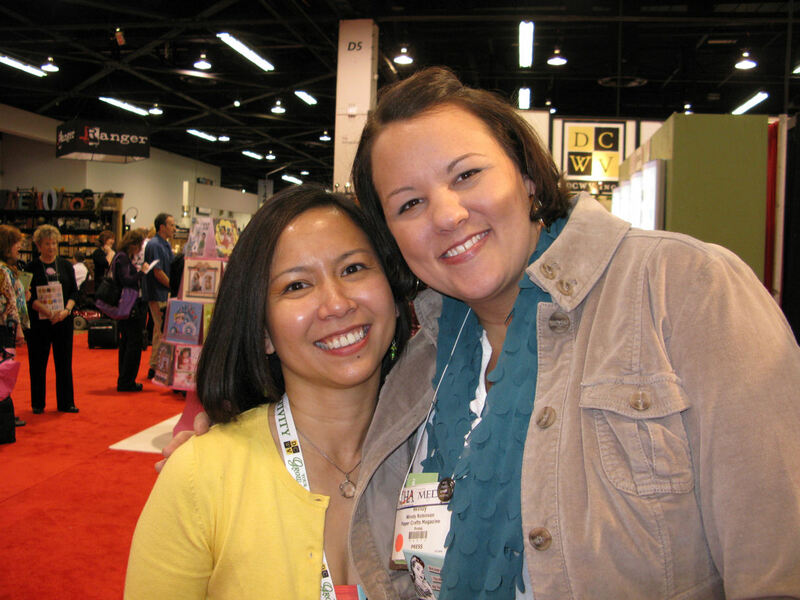 I am so thrilled that Kristy decided to keep me and let me continue my journey with SOG. You can see her announcement on last Friday HERE. On to the release. It's FAIRY time. I love anything fairy related, so this is soooo up on my alley. One of my favorite fairy related story is The Fable Haven series by Brandon Mull. Love that series. Oops... back to SOG fairy. Hah... so easily distracted. Today, we are highlighting Flower Fairy and I think she's a cutie and spunky, too. This time, I decided to be bold and let my fairy have blue hairs. I have to remind myself sometime, to color differently, that hair don't always have to be brown, black, or blond. That it can be ANY colors! 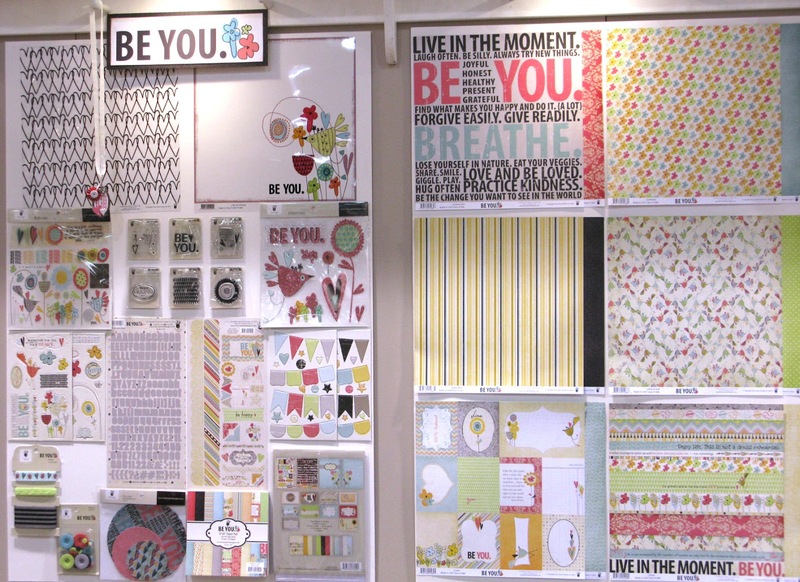 The new DT has created some superb samples for you all to check out. You can see them at Some Odd Girl blog. 4 more days before my trip to Bali!! My cousin Julia is flying out with me, so at least I won't be alone. Still o many things to do and so little time. Have great week everyone! Let's get on with the CHA report, shall we. Now, there are tons and tons of booths to cover and I did take tons of pictures, but I am sure many of you already seen lots of sneak peek from other site. So, I'll just highlight my favorite collections. First up, This & That and Note To Self collection from Echo Park. Gorgeous papers! You can click on any of the pics to view it in larger size. 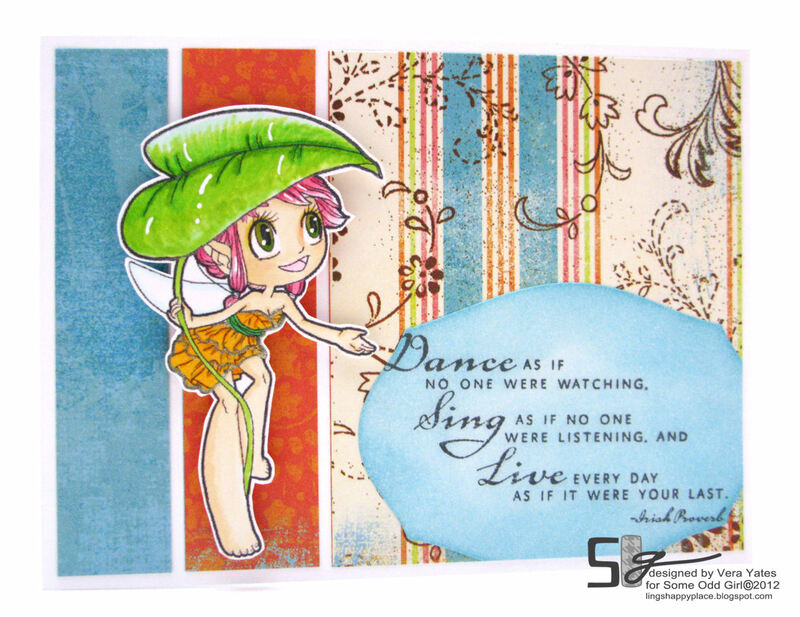 I love, love, love Ali Edwards stamps for Technique Tuesday. Love her unique style and the stamps aimed at both card makers and scrapbookers. The layovers from Hambly are so cool! On my wish list. My Mind's Eye 6x6 paper pads and fab stamps. Love that their stamps only cost $5.99 a set. Gorgeous + reasonably priced = awesomess!! 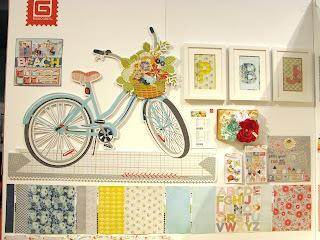 Cute display at Paper Smooches. 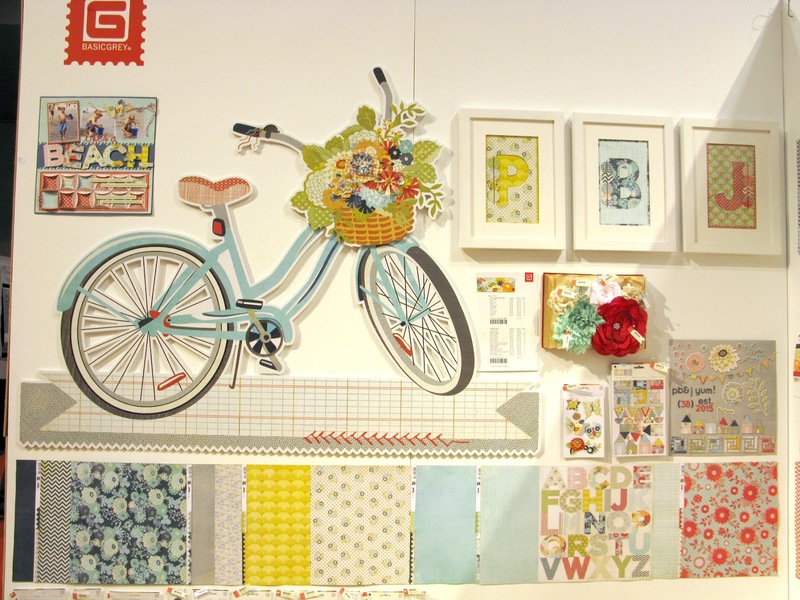 Beautiful paper pad from Studio Calico Take Note collection. Gorgeous overload! 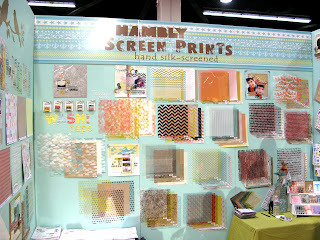 Right underneath it are some layout samples that were on display at their booth. 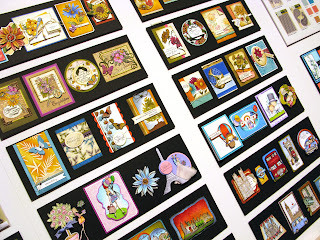 Card samples display at Penny Black booth, where I met the lovely & talented Elizabeth Allan who designs for Penny Black. This one pic, I just had to share! This beautiful peacock was on display at DCWV booth and yes, people, it made of papers!! 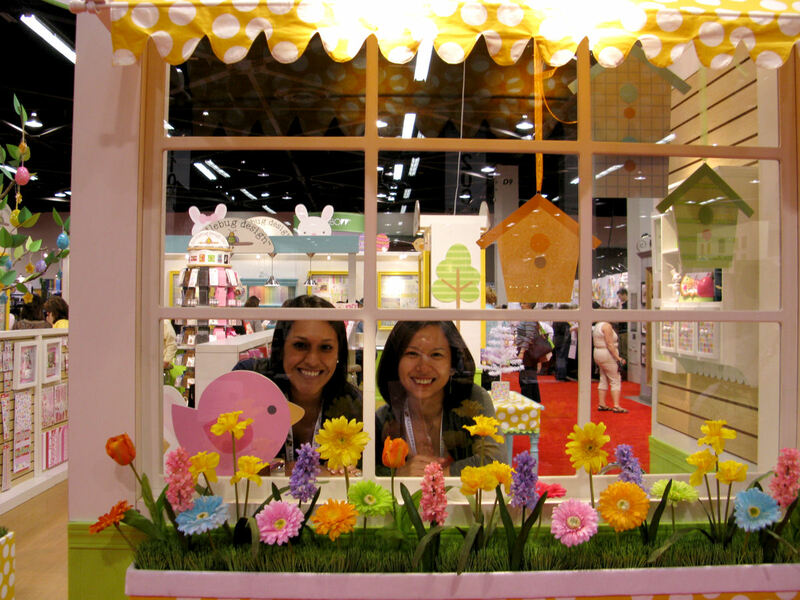 It's my favorite booth for their awesome display. They also have parrot, toucan, etc. 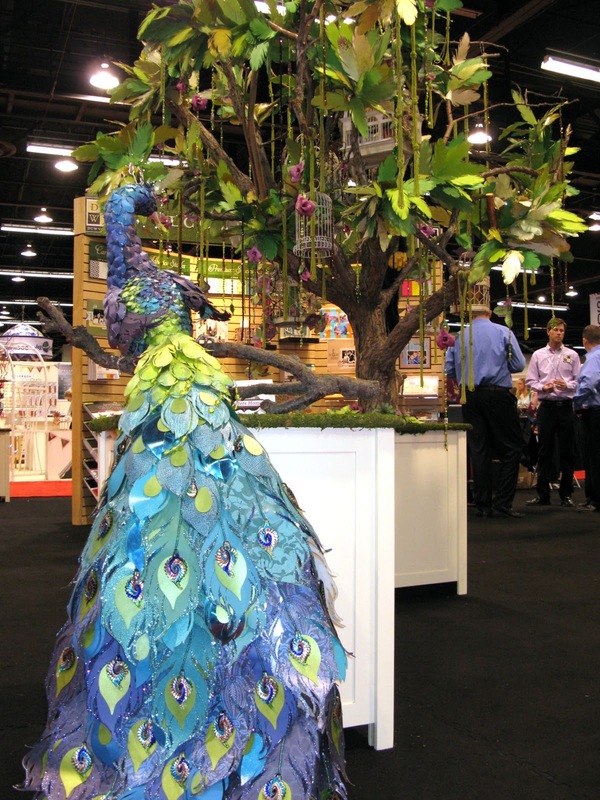 Even the tree was made of paper leaves. Simply gorgeous!! Now, I know many people love Basic Grey and I wasn't one of them. Until.... I saw their newest collection. This one below is from their Konnichiwa collection. Gorgeousness!! So, which one is your favorite? All that I shown here... I like them all. Hard to choose. 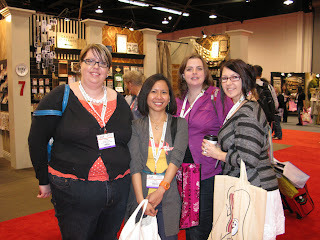 Now that I have enable you and make your wish list longer, let me share some more fun pics of the lovely peeps I met. BTW, Tori Spelling & Vanna White was there, too and I completely miss them. Things a bit crazy on the last day, so I totally missed Tori. 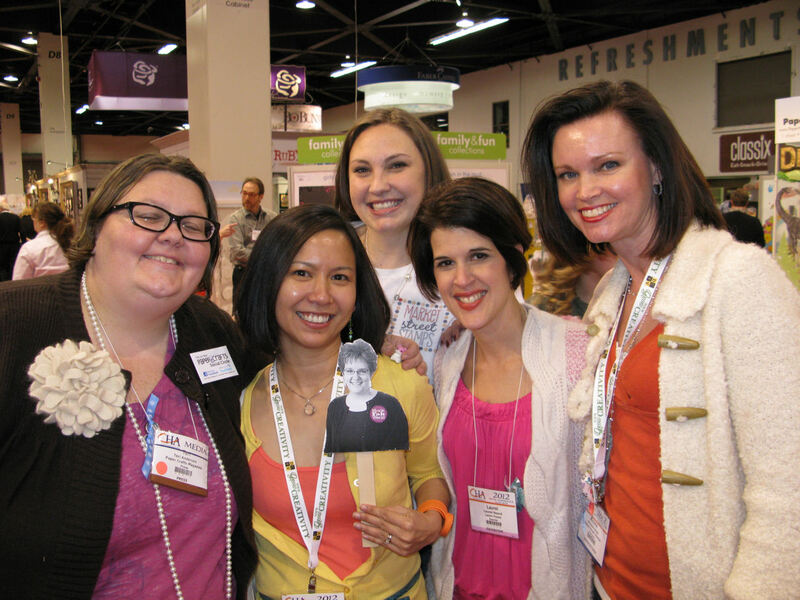 From top left: With Kelly Purkey, Elizabeth Allan, Kim Kesti, Kelly from Paper Crafts, at Paper Crafts meet & greet with Teri, Stephanie Washburn, Laurel Beard & Michelle Gross, Windy Robinson, & Heidi Van Laar. But, I sure am glad to be back home. I have 6 more days home before I go to Bali for my brother's wedding. Am trying to savor my moment with hubby, Ollie, and Eli. Hubby is so good to me. Every day while I was at CHA, he sent me pics and videos of Eli, our bouncy puppy. Anyway, the trip was such a whirlwind. It was fun to be able to see all the new products that coming out soon. Lots of yummy goodness added to my wish list. But, of course the most fun is seeing old friends, meeting new friends, and getting to know those you only have met online before. First night, I had dinner with with miss Lawn Fawn, Kelly Marie and her hubby, Mike, Laurel Beard, Ayana Posadas, Chari Moss, Jenny Suchin, and Nancy Krueger. 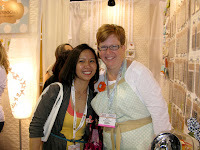 I gave Nancy extra hugs from Barb when I saw her. Nancy and Barb supported me since the very beginning when I started blogging. Here's a line up of pics for today and I'll share more tomorrow including some of my favorite products. 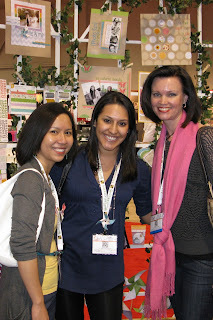 At Lawn Fawn booth with Laurel B and Ayana. and Leah L'Orange. I am so lucky to be in their team. 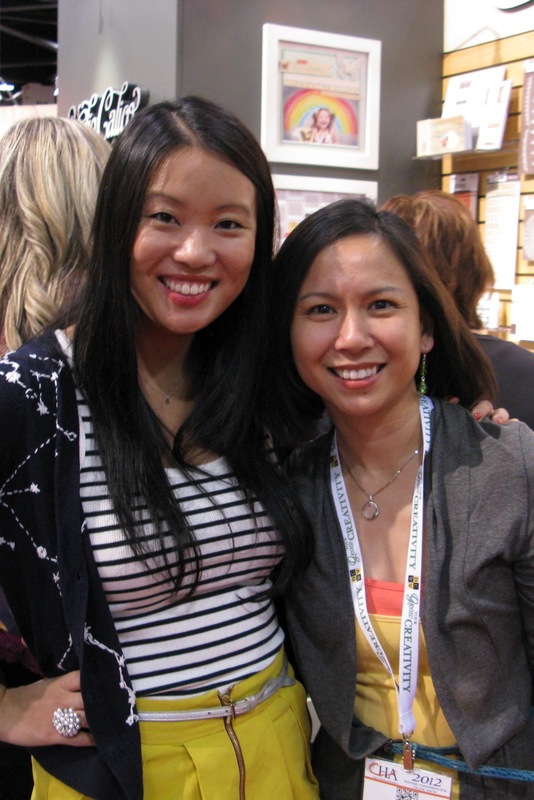 With my Cards That Care partner, the cutest mom-to-be Jennifer McGuire. 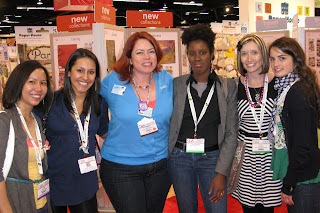 Me, Ayana, Susan Opel, Tenia Nelson, Kim Wilson, & Maile Belles. This group... I am so psyched to see them. 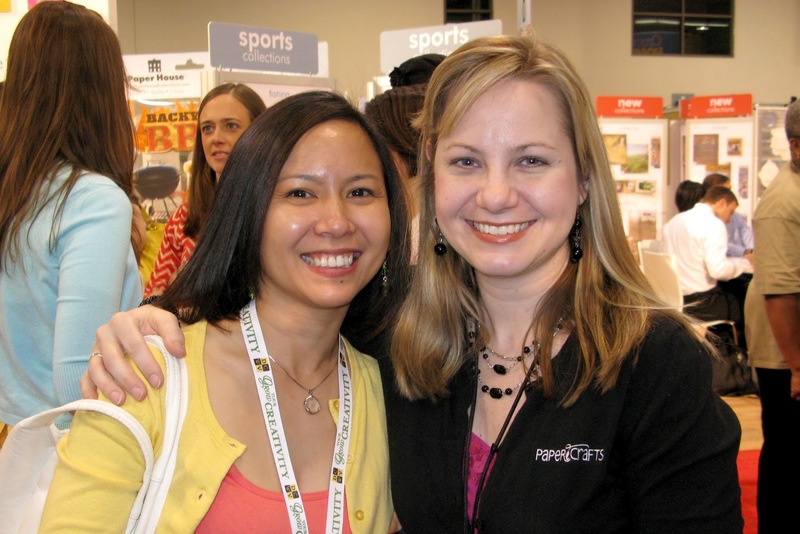 Susan always so bubbly and full of energy. And Tenia, Kim, & Maile are just the sweetest. 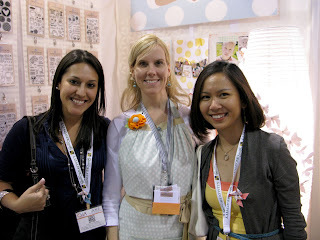 When it comes to Papertrey Ink, Maile's stamps are some of my favorites!! And, Tenia... look how stylish this new mom. Yes, she just had a baby a few months ago and look how tiny her waist already. Kim is sweet & adorable. Seriously, this pic filled with so much sweetness from these girls. 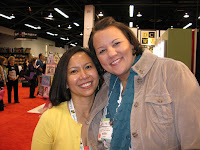 Yay... finally get to meet Michelle in person. Fab girl. I adore Michelle. I was with her on a DT a while back and she's so supportive & thoughtful. Love her! 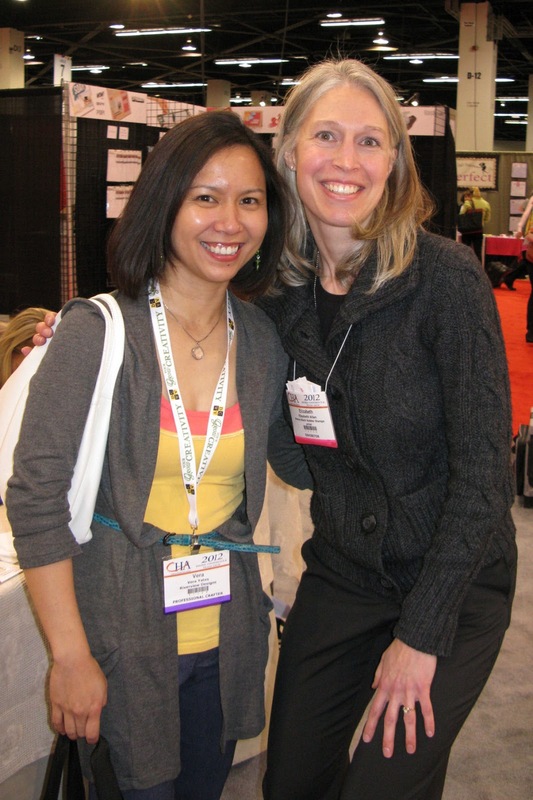 She's the owner of CAS-ual Friday challenge, which is an awesome challenge site. 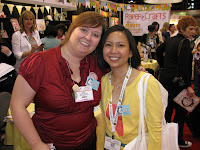 At Paper Smooches booth with Kim Hughes. 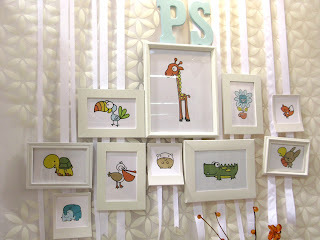 My favorite pic, at Doodlebug booth. 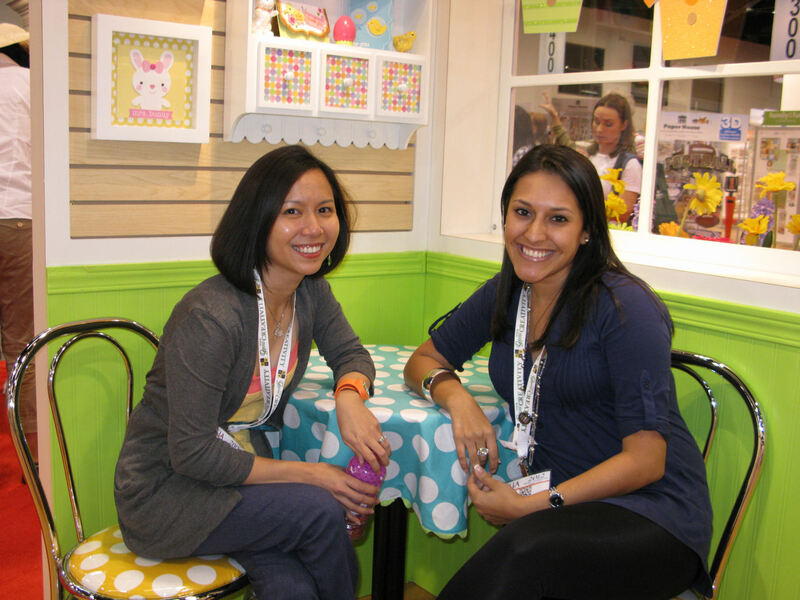 They have uber cute booth! Ayana is so adorable. Had so much fun walking around with her. Love, love, love spending time with her. 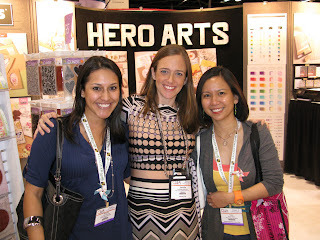 With Jill Foster, who is the sweetest! She has a smile that can brighten a whole room instantly. Now, how about a peek at one of the product that I thought was just so cool? Join the revolution with Inkadinkado. I was just recording it with my i-phone. No sound, just want to show you how their new gear works. So, what do you think of this new gear? I was super excited when I saw how it works. However we have to wait for a while before we can get our hands on this handy gear. They're shipping in August! !